Warki Poori is a flaky layered poori that tastes so sinful with any side dish. The layers are separated by a paste of rice flour and ghee and make a wonderful dish. I remembered seeing a Varki Poori and I twisted the dish name to make sure it suits Warki. I made this along with another dish and everybody loved this so much. So much so that Konda wanted this to be repeated and I kept some dough just for her sake. All of us enjoyed and I would surely be making it again. Warki Poori is my choice for W in the AtoZ Flatbreads and More, where I am making AtoZ Indian Flatbreads. 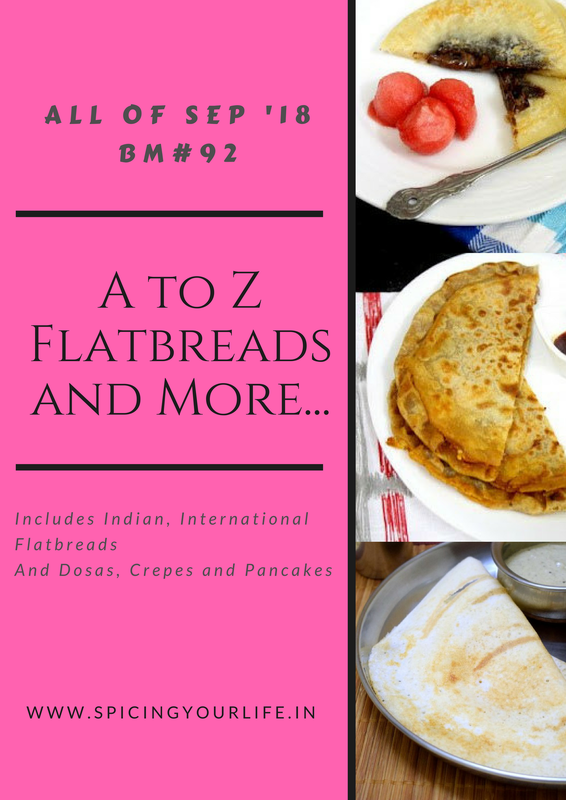 If you are keen on knowing what’s W in AtoZ Dosa Varieties. Mix the rice flour with the ghee and make a smooth paste. Take the maida and wheat flour in a bowl along with salt. Add the milk and enough water to make a soft dough. Spread the rice paste on the top surface. Transfer to a plate and keep it aside. Now continue rolling out all the rest of the balls. Take the first rolled out disc, spread the rice and ghee paste on top completely. Place the second layer, spread the paste again on top. Like this, continue with the remaining discs. Once you are done, from the bottom roll over tightly to make a swiss roll. Cut into rings. Dust and press each ring lightly and roll out again. Heat a kadai with oil and when hot, cook the puris on both sides. Serve hot with a side dish of choice. How cute and tempting those pooris looks,layered pooris looks extremely inviting to enjoy with some potato or channa masala, tempting me to the core. That looks gorgoeus Valli…it is a new technique for me and I got to revisit to understand it properly. Awesome pick….so tempting! Warqi pooris look amazing , the layers are showing up so well . Served with some chole or Aaloo Sabzi it would be such a treat . I am amazed at the variations of warqi paratha / poori , must try all of them . We should have a theme where we make one thing in different ways . I made the warqi paratha once for a celebration and loved it to the core. Deep frying will make it more delicious and would be a rich dish. With some spicy paneer side it would be amazing. Warqi paratha is great hit with W… Love the flaky and crispy poori recipe. Awesome share Srivalli, love the flaky layered puris. Feeling hungry , looking at the delicious puris. Wow warqi Puri is also there, never knew. The Puris looks so flaky and yum. Warqi paratha are so good but these warqi poori are the best! Would love to make this for the kids. warqi poori came out nice and tempting me with side dish. such a scrumptious meal it makes. you mastered flaky art by now. Wow, love those layered pooris. You have just covered so many different flatbreads in this series and this Warqi poori looks very tempting.